Traverse the mountain from East to North via the Chogoria and Sirimon routes. Climb Point Lenana, the highest trekking peak on Mount Kenya. Day 1: Nairobi - Mt Kenya Bandas (2,900m) 3hrs, 10km walk, 950m ascent. After pick up in Nairobi, we drive through agricultural country up to Chogoria town for lunch. After lunch, we take 4x4 and drive up to the edge of the bamboo forest where we start our trek through the dense bamboo forest for distance of 10 km up to the Mt Kenya Bandas. 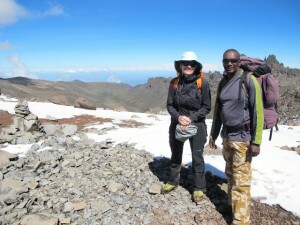 Day 2: Mt Kenya Bandas - Minto`s campsite ( 4,200m) 8-9 hrs, 17km, 1,400 ascent. After breakfast, begin a 5 hour descent via Mackinder`s valley to the Judmiere camp. ( 3,300m) The descent is gentle and it offers ample time to enjoy fascinating scenery which includes the moorlands before reaching the camp. Dinner and overnight at judmiere camp. Day 4: Judmiere Camp - Nairobi. 2 hrs walk. After early morning breakfast, descend for 3 hours to the Sirimon Park gate to catch a vehicle for the return journey to Nanyuki for lunch. Later transfer back to Nairobi arriving by 1700hrs. Tip: Day 2's hike is a long one involving a steady climb up to Mintos. Hikers who are not limited by time can take an overnight stopover at the Nithi Camp (3300m) mid-way to Mintos. From here they can explore the nearby Nithi Falls or climb Mugi hill (3500m) for better acclimatisation. Alternatively you can hike directly to Mintos/Halltarn and spend an extra day here instead to recuperate and explore the Gorges Valley which also accords you a better acclimatization due to the higher altitude.